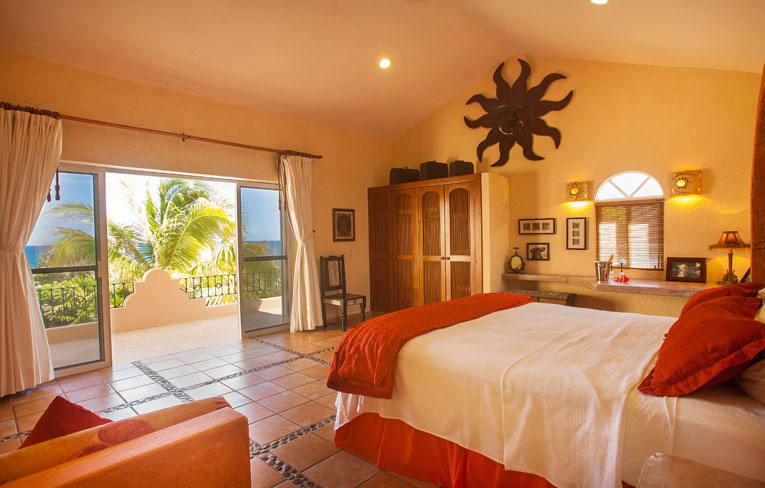 Brisa Caribe, located on the Mayan Riviera, offers luxurious accommodations within nine unique bedrooms and boasts breathtaking views of the sea. 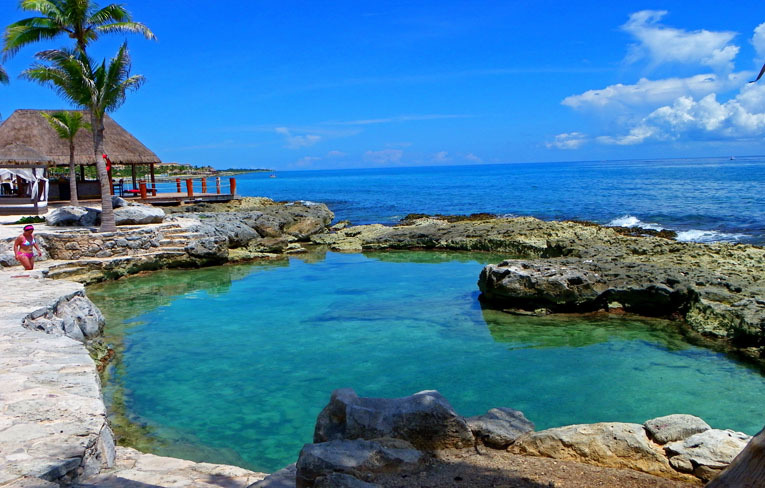 For relaxing in the warm sun, Brisa Caribe showcases three stunning pools and cascading waterfalls. 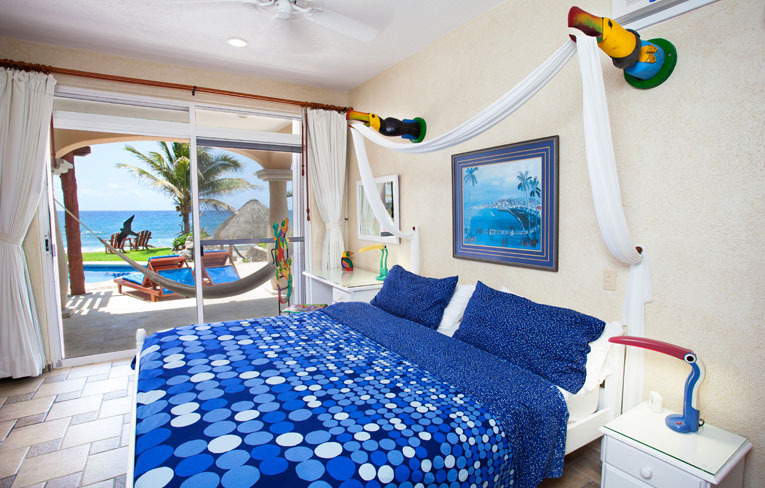 Brisa Caribe, located on the Mayan Riviera, offers luxurious accommodations within nine unique bedrooms and ten baths, boasting breathtaking views of the Caribbean Sea. 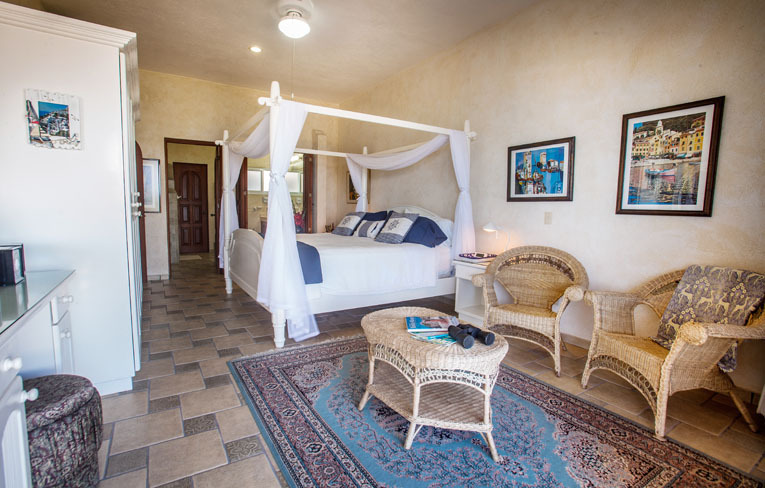 The fully air-conditioned villa provides guests with an entertainment room and stocked wet bar as well as a rooftop bar and dining terrace perfect for some al fresco dining! 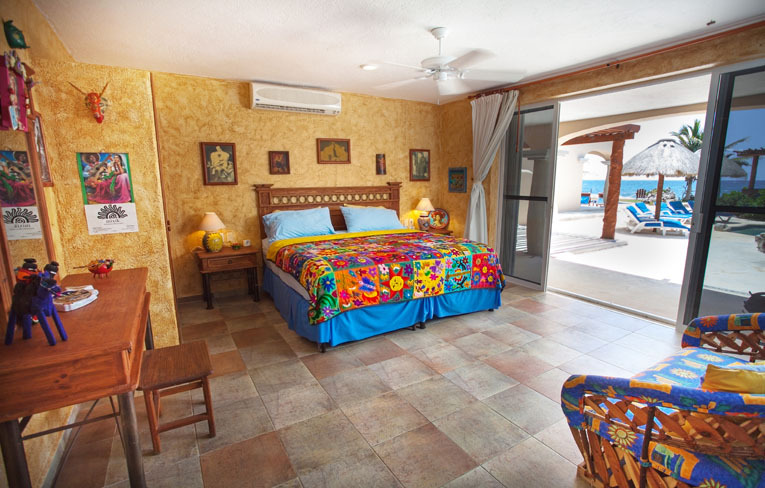 For relaxing in the warm sun, Brisa Caribe showcases three stunning pools and cascading waterfalls, including a fresh water and salt water pool. 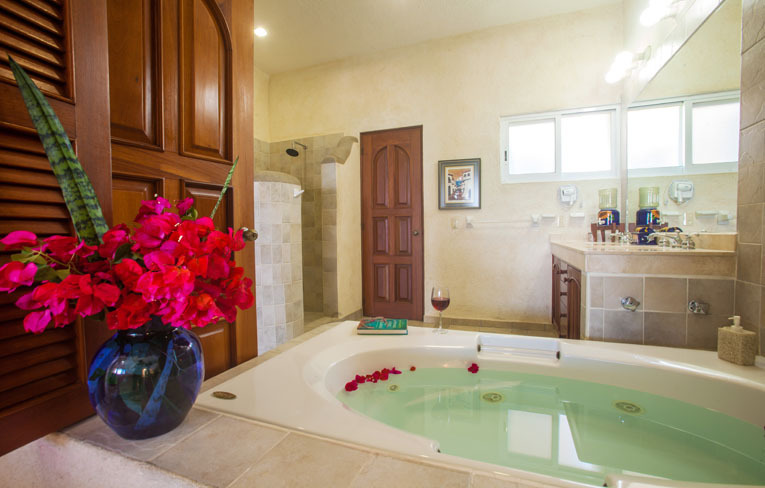 Unlike other luxury villas, owners Doug Wasmuth and Shelly Korol have designed Brisa Caribe to have a home-away-from-home atmosphere. 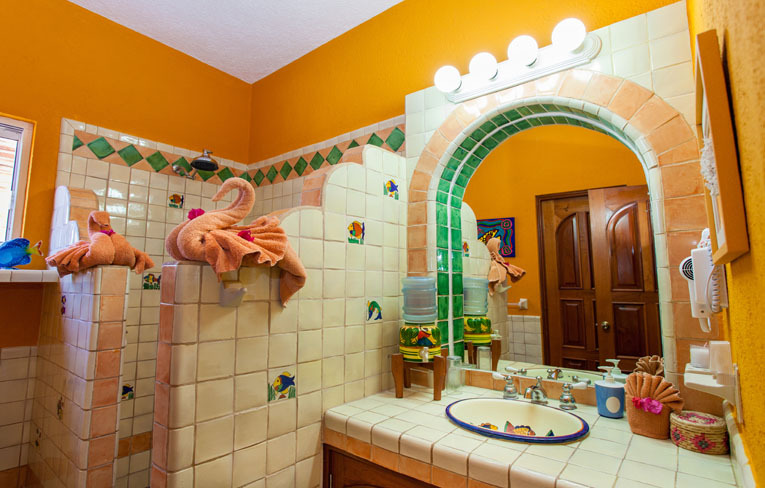 As their year-round home, their personal touches are felt throughout to provide a comfortable vacation rental for guests. 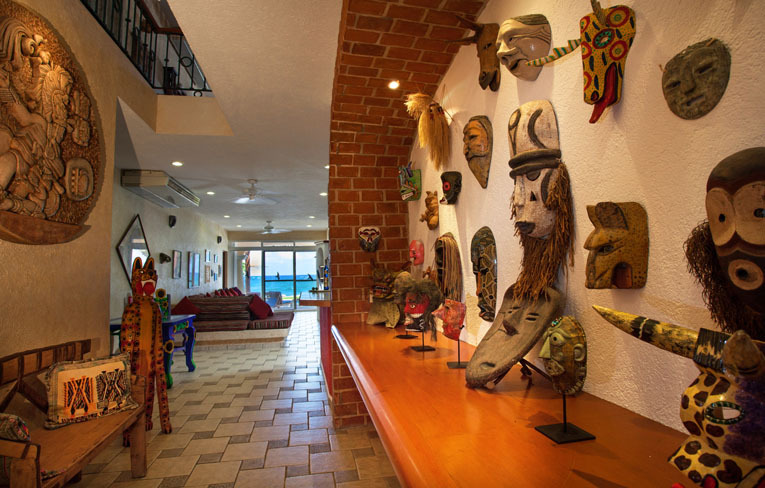 Through their many travels, they have gained many treasures and artifacts that sprinkle the home with remarkable personality and an eclectic design. 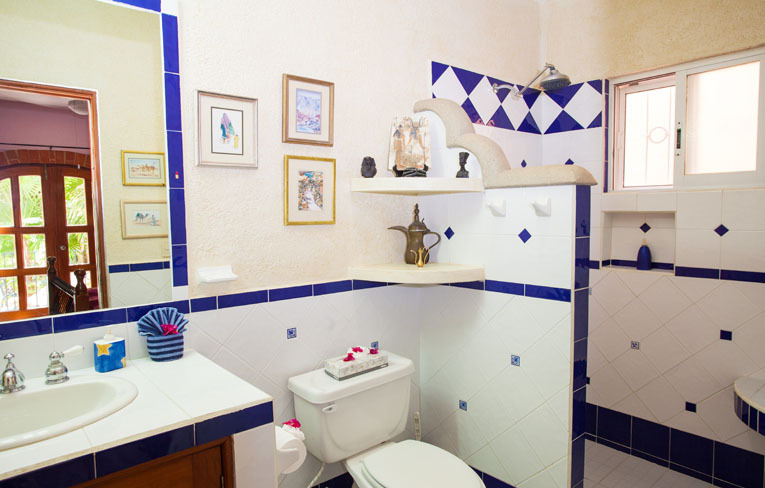 Each room within the villa has a different theme, with classic décor and unique cultural pieces to reflect the theme. Themes include: Asia, Africa, Bombay, Buenos Aires, Caribbean, Mediterranean, Mexico, Persia and South America. 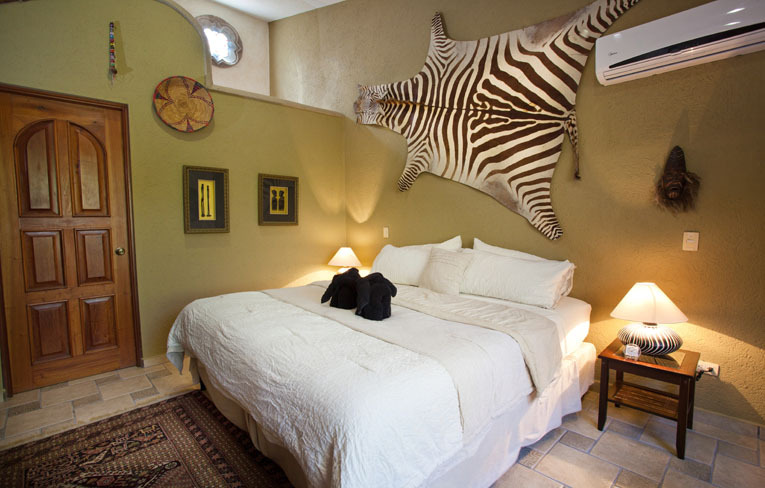 Its personal touches like these that have guests elated about the property. 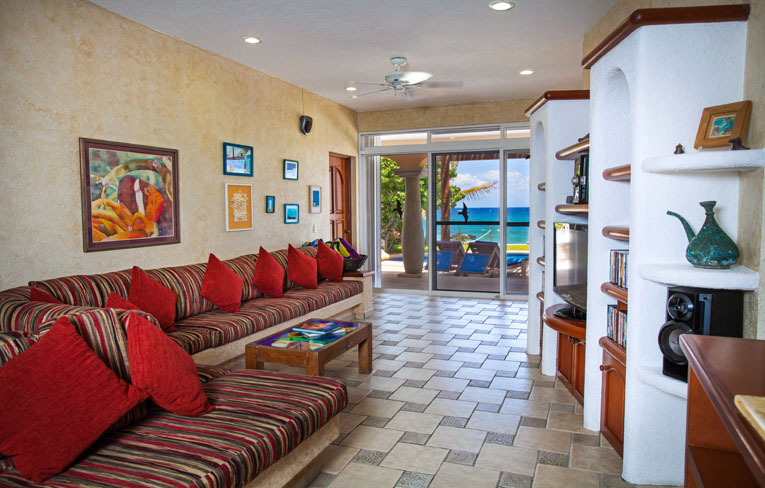 The ground floor is centered around an entertainment room that flows right outside onto the terraces and pools, with beach area and ocean just beyond. These outdoor areas are quite spacious and spectacular. 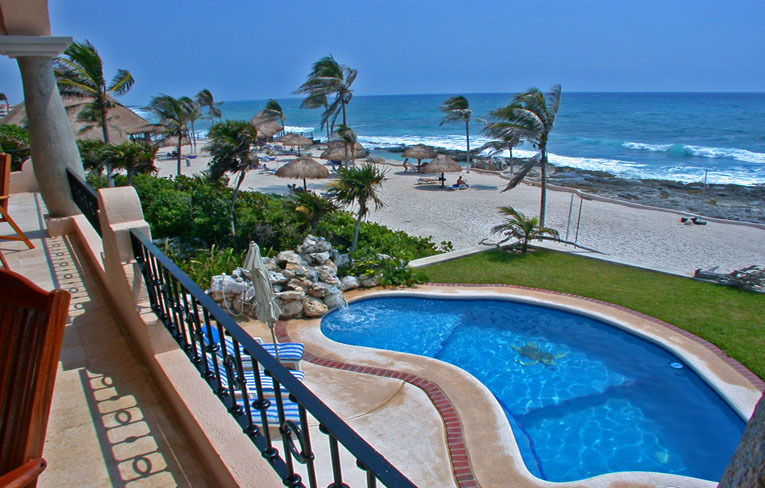 Two of the oceanfront lots are dedicated to guests, while the third has pools and lounge areas for the owners' private use. Their separate little oasis is tastefully hidden behind a large rock waterfall and a scattering of vegetation which blends in well with the environment. The development of the three lots has been thoughtfully designed to provide privacy, great views, and plenty of room for your entire group to spread out over. 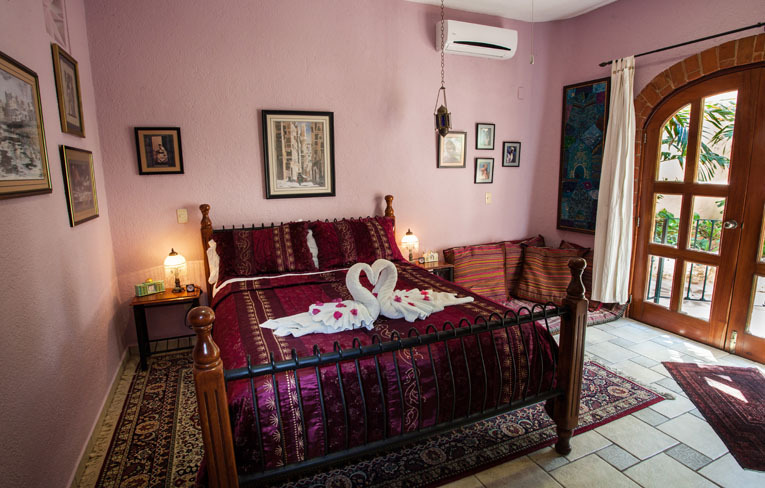 Next to the villa on the second lot is the 'Pool House' with two additional detached bedrooms that are opened up to groups who rent seven or more bedrooms. This gorgeous addition includes a large patio area ringing a shallow wading pool with waterfall that is ideal for the little ones to play or the adults to soak. Off to the side is a covered poolside wet bar and BBQ area with full size refrigerator to keep your drinks cool and close at hand. 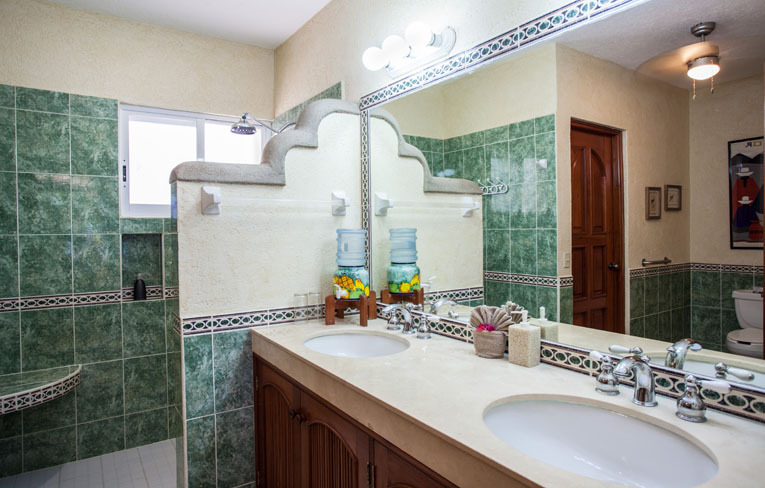 One of the main features of the villa is its large open kitchen, ideal for entertaining families or large groups. Wrapping around the kitchen is a large serving/dining counter with stools where six can sit comfortably. 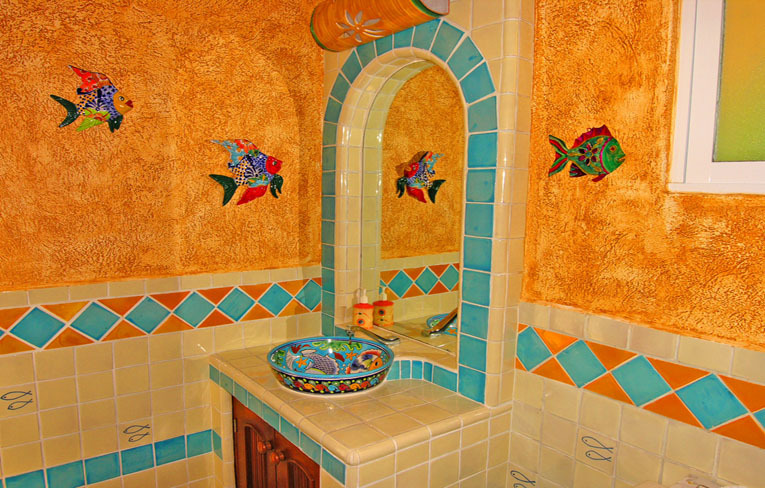 In the kitchen and attached pantry, you will find all of the appliances, cutlery, dishes, pots, pans and tools needed to prepare anything from a simple snack for two to an elaborate dinner for 20. Of, if you'd prefer outside dining, the Rooftop bar and dining terrace allows guests to take advantage of the beautiful views and Caribbean sunsets. This large area has built in benches, a covered wet bar with wrap around counter, stools and a gas bar-b-que waiting to grill up a steak or the catch of the day. 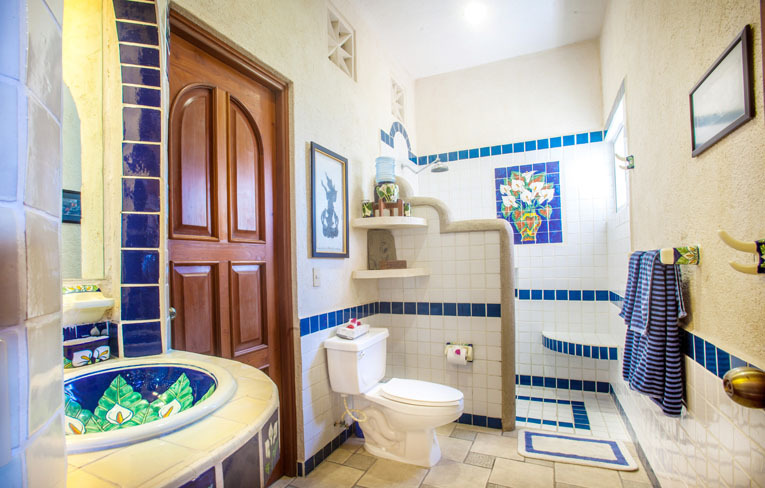 Any guests choosing Brisa Caribe as their vacation home will see their expectations met, and exceeded. 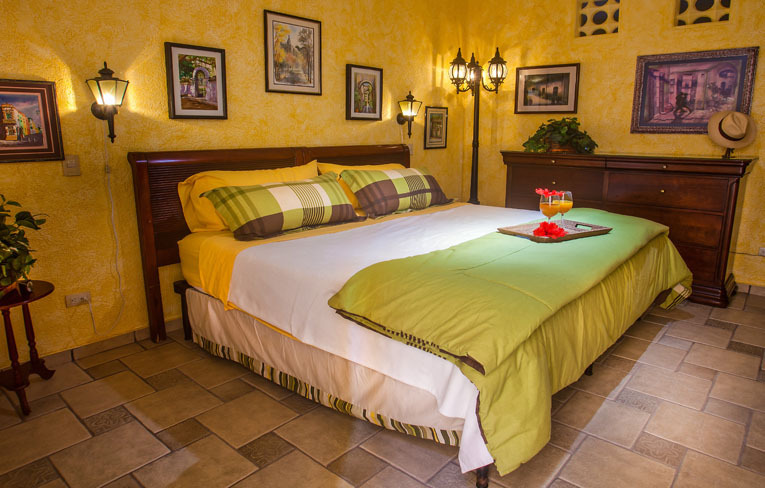 The character and charm of the villa paired with its luxurious amenities and details will have guests returning for another trip. The result is a home which tells stories of many travels and yet, is the kind of place where one can easily relax and feel at home. 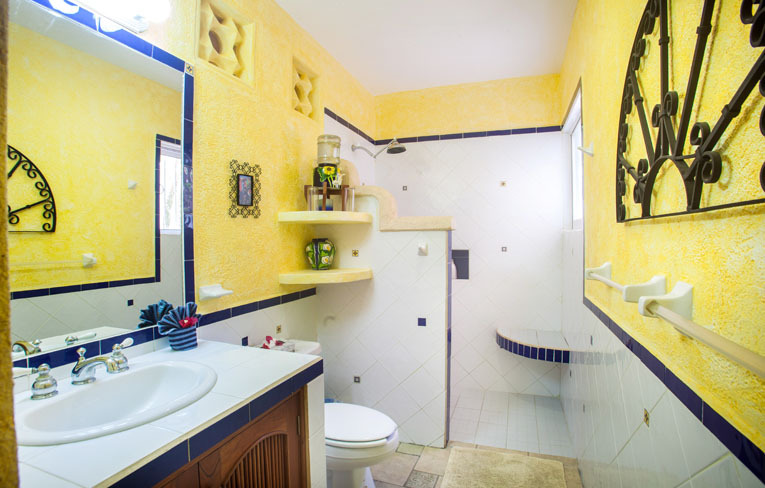 Located on the Riviera Maya of Mexico in the gated community of Puerto Aventuras. 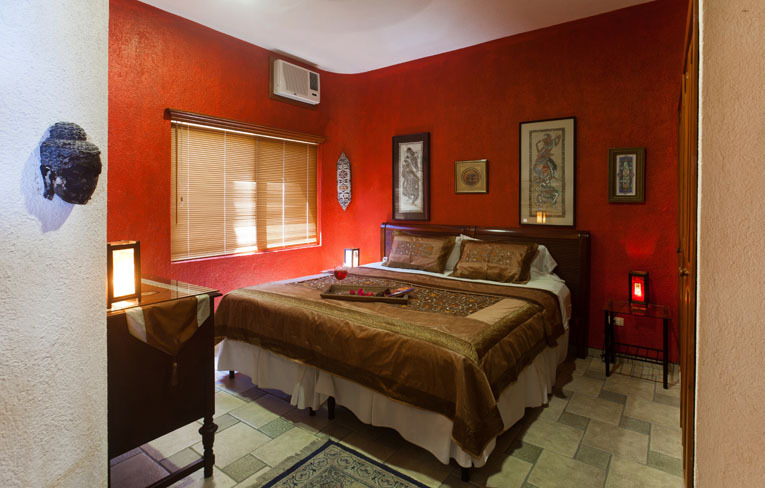 Brisa Caribe is a one-of-a-kind vacation experience located in the exotic Caribbean. 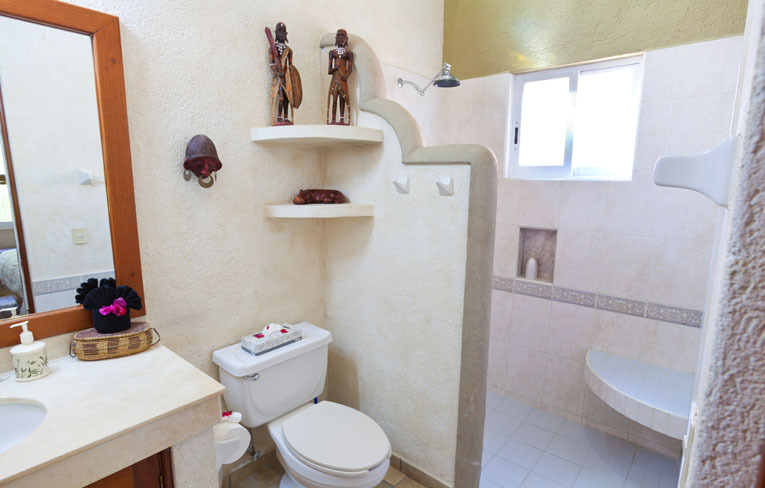 Guests will love the attention to detail and personal touches of this unique villa. 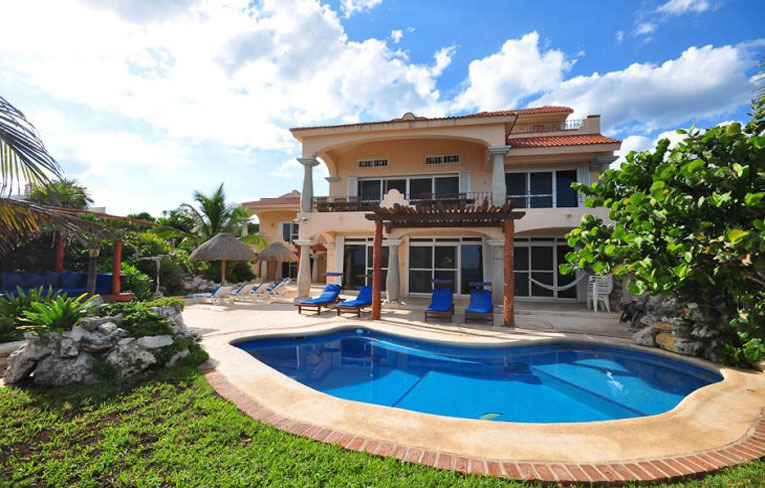 With 9 bedrooms and 10 baths, this villa is great for entertaining large groups or families. 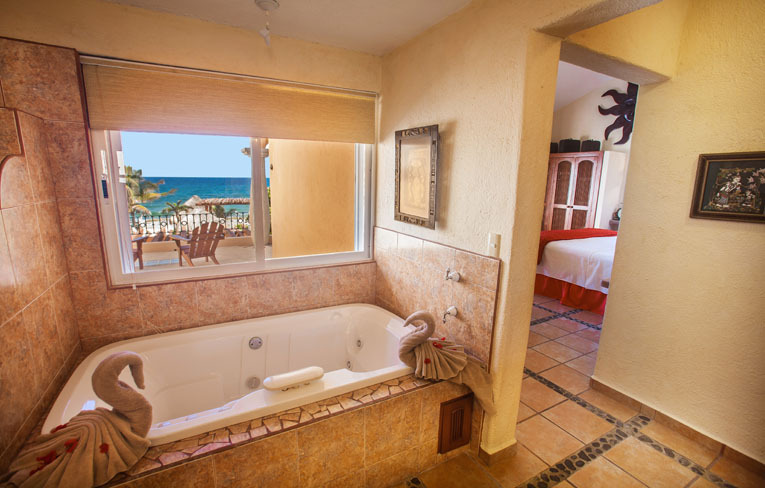 Brisa Caribe is situated within Puerto Aventuras on an exclusive piece of coastline referred to as 'Las Rocas' or 'the rocks.' This short, flat, strip of rocky coast separates a white sand beach on one end and the entrance to the marina on the other. 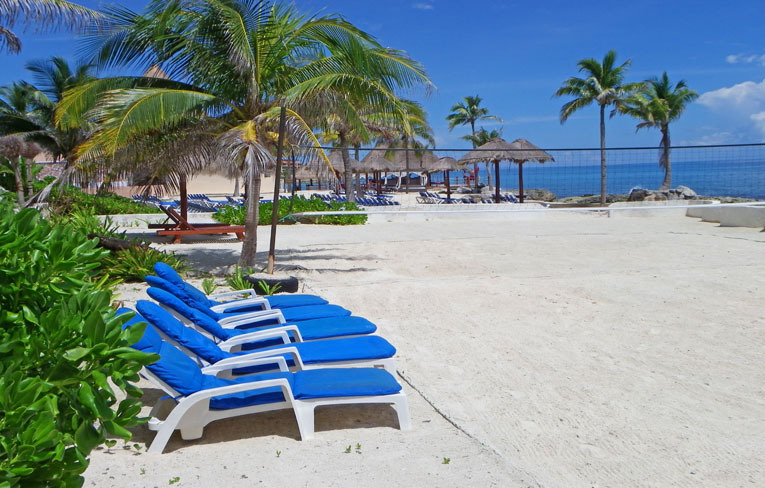 Brisa Caribe is located at the end nearest the beach. Here the sand spills out over the rocks and in front of the villa. 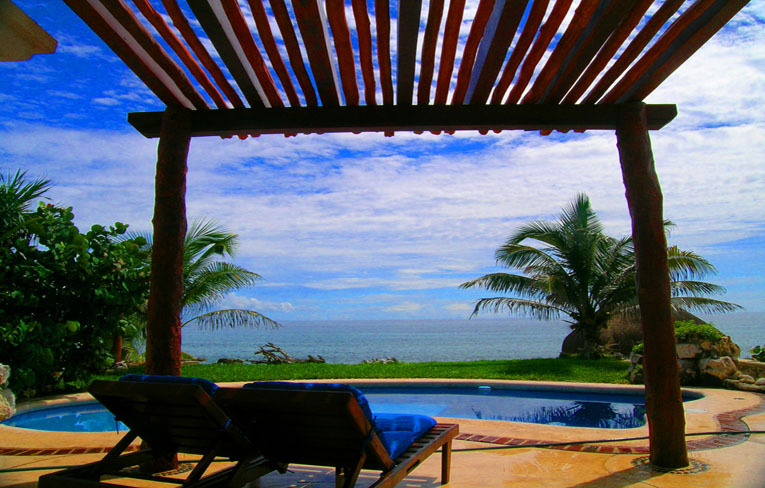 A palapa umbrella with hammocks and lounge chairs in the sand, make this a tranquil place to relax. 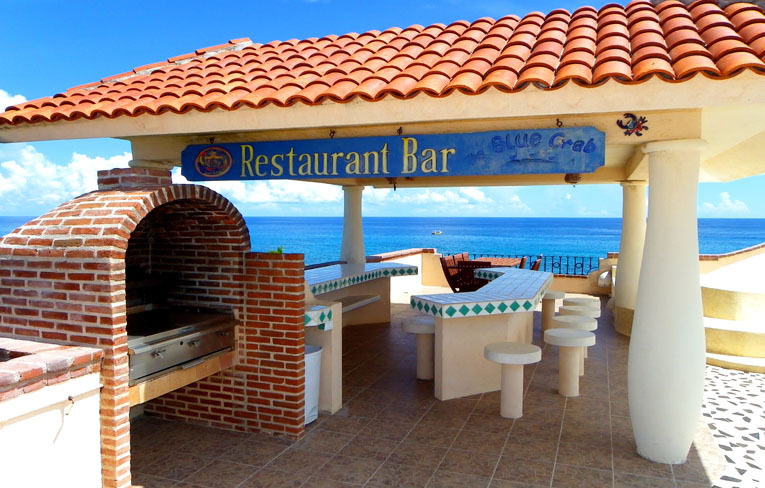 The rooftop bar & dining terrace area offers ocean views and a layout perfect for al fresco dining. 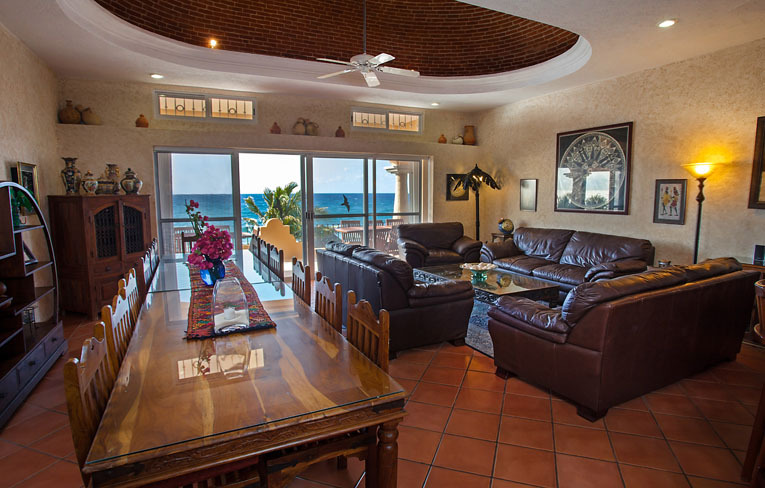 Guests can use this area to share a refreshing drink, fire up the bar-b-que, or to watch the sunset over the Caribbean Sea. 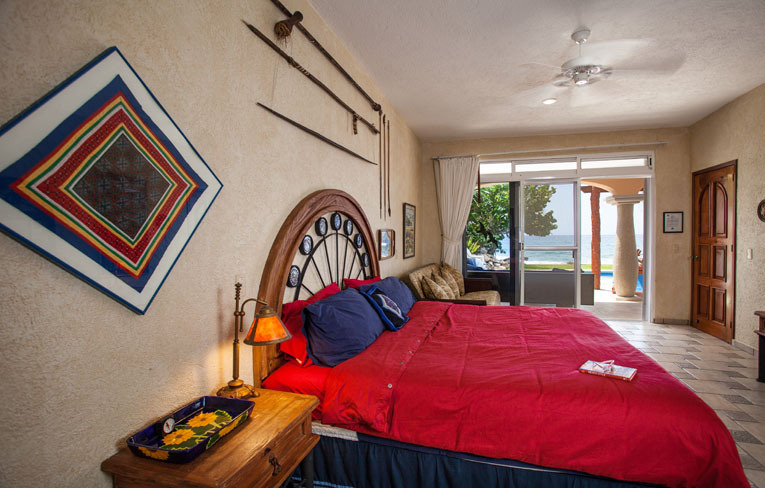 The usefulness of this area means that there are 6400 square feet, plus garden, pool and the beach for you and your group to spread out over. 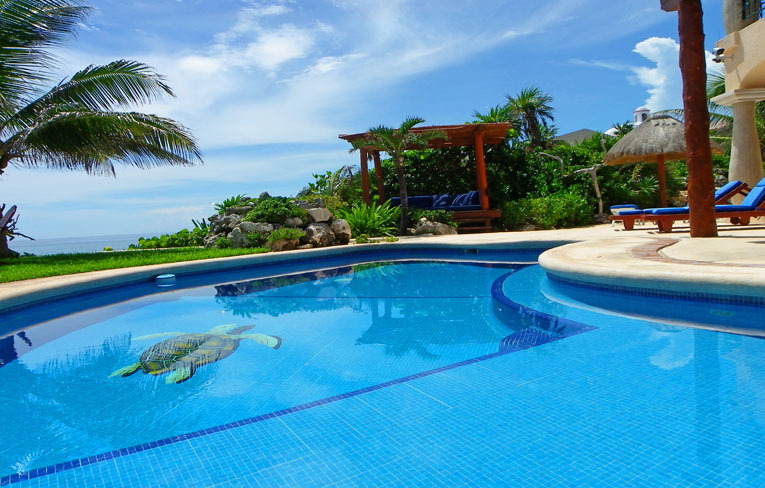 The villa offers 3 pools for guest's use. The main, fresh water pool, has 3 levels with a waterfall and surrounded by chaise lounges and umbrellas. The children's pool is filled with sparkling fresh water perfect for wading. A 100 yards down the sand on public beach area, sits the saltwater pool for all ages. 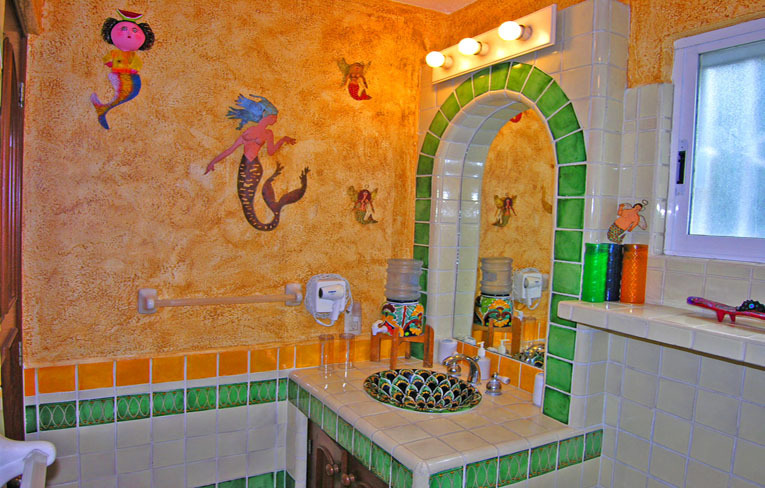 The pools offer outdoor showers to rinse off and are outfitted with beach towels, beach chairs, coolers, and pool toys. 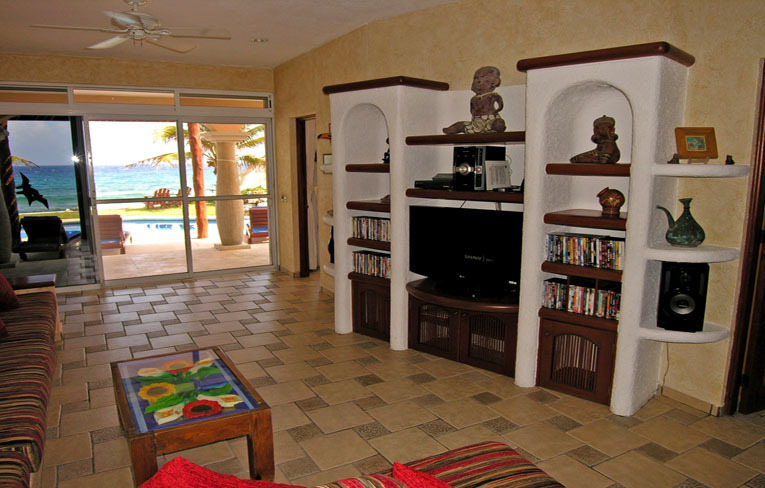 A focal point of this villa is the large great room and kitchen area. Here the cook or bartender is the center of attention and is rewarded for their efforts with one of the best views in the villa. Wrapping around the kitchen is a large serving/dining counter with stools where 6 can sit comfortably. Included in the great room is a collection of leather sofas and chairs, providing a relaxing place to sit and visit or to just enjoy the view.